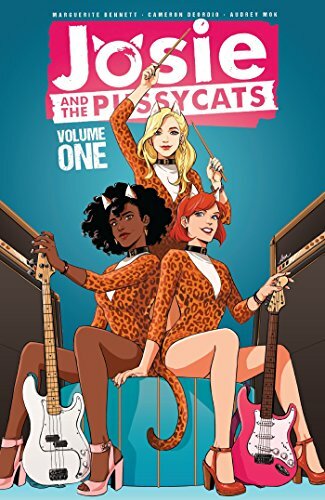 JOSIE AND THE PUSSYCATS VOL. 1 is the first collection of an all-new take onthe world's biggest comic book band. Marguerite Bennett (DC Comics'Bombshells, Marvel's A-Force) and co-writer Cameron DeOrdio team withAudrey Mok (Heroine Chic) to retell the origin and story behind the music forJosie, Valerie and Melody. Friends, countrymen, lend me your long tails and ears for hats--the Pussycats areback! In this series kick-off, Josie's getting the band together to help achieve herdreams of musical stardom. But for the group to last, it needs a strong foundationof friendship and trust. Can the girls get going, or will Alexandra Cabot's plottingput a stop to the whole thing? Don't miss comics' supreme songstresses' return tothe limelight in this exciting first volume!